Microfiber is synthetic fiber finer than one denier or decitex/thread. This is smaller than the diameter of a strand of silk, which is itself about 1/5 the diameter of a human hair. 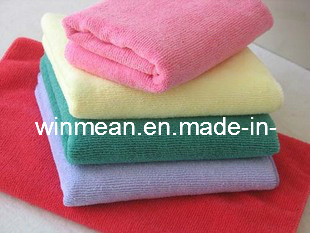 Microfiber is used to make mats, knits, and weaves for apparel, upholstery, industrial filters, and cleaning products. The shape, size, and combinations of synthetic fibers are selected for specific characteristics, including softness, toughness, absorption, water repellency, electrodynamics, and filtering capabilities.